Let me discuss the reasons for considering Chos kyi nyi ma as the 9th Panchen Lama. The first Panchen, who was the chief disciple of Tsong kha pa, was named Mkhas grub Dge legs dpal bzang, second was Phen sa pa Blo bzang don grub, third Bsod nams phyogs kyi glang po, fourth Blo bzang chos kyi rgyal mtshan, fifth Blo bzang ye shes, sixth Dpal ldan ye shes, seventh Bstan pa’i nyi ma, eighth Bstan pa’i dbang phyug, and ninth Chos kyi nyi ma. The Panchen Lama is an emanation of the Amitabha Buddha, and since all the above mentioned names have been recognized as emanations of Amitabha, they were also considered as Panchen Lamas. Furthermore, the Panchen Lama, while he was in China, had signed many of his photographs as the 16th. It seems that the reason for it was that many more emanations of Amitabha, such as Atisha, were also included in the line of Panchen Lamas. 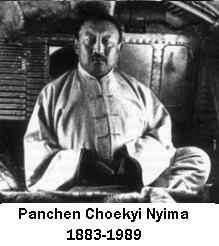 The majority of Tibetans recognize Chos kyi rgyal mtshan (4th according to Bkra’ shis lhun po) as belong the 1st Panchen. It was during his time that the Bkra shis lhun po bla brang was built and named Rgyal mtshan mthon po. Since his death the officials of the bla brang have installed the successive reincarnations. Therefore it seems the recognition of Chos kyi rgyal mtshan as the 1st Panchen to be the most justifiable, and in many of the books written by foreigners Chos kyi nyi ma has been referred to as the 6th Panchen Lama. In the interim between the death of Yon tan rgya mtsho (4th) and before the finding of his reincarnation, Central Tibet (Dbus and Gtsang) was held by the King of Gtsang. The king of Gtsang was a very devout Bka’ brgyud pa, but was very anti-Dge lugs pa.
At one time he sent his troops to attack ‘Bras spungs and Se ra and caused much damage to these two monasteries. Under these circumstances the King resented the Mongolians because of their patronage of the Dge lugs pa sect and proclaimed an edict that the search for the Dalai Lama should not be carried on, for he feared that his power would be curbed once the Dalai Lama was installed, since the Dalai Lama, as an emanation of Spyan ras gzigs, commanded the faith of everyone. At that time the King of Gtsang was very powerful and no one was in a position to threaten that power. But, the Panchen Lama of that period, Blo bzang chos kyi rgyal mtshan, made many attempts to have the Dalai Lama recognized. In spite of his efforts, the king refused to allow the search to be resumed. At one time the King was suddenly taken ill and appeared to be on the verge of death. The Panchen Lama was asked to grant him blessings and the King’s life was saved. Then the Panchen again appealed to the King to have the search for the Dalai Lama resumed, and the King consented. The fifth Dalai Lama was then able to come to the throne. The Panchen also served as religious tutor to the Dalai Lama. The reasons for the Panchen Lama’s endeavors in the interest of the Dalai Lama were that the 1st Dalai Lama had established the monastery known as Bkra shis lhun po and Panchen Chos kyi rgyal mtshan had been a pupil of the previous Dalai Lama. So the Panchen did what he did because of his religious beliefs. There has always existed a friendly relationship between the Dalai Lamas and the Panchen Lamas and because of this in each successive generation one had acted as tutor to the other depending on their ages. Moreover, the relationship was at its best during the reign of the 7th Dalai Lama and 5th and 6th Panchen. Lamas respectively. Due to this the Tibetan government had made large grants of estates and rdzongs to Bkra shis lhun po bla brang. The rdzongs that were given over to Bkra shis lhun po were: Lha rtse, Ngam ring, Phun tshogs gling, Gam pa, ‘Dam bla ma, Bzhad mthong smon, Lhan lhun rab, Rta nag rin rtse, Rgyal rtse brag khud, and Lcib lung. Also from such rdzongs as Gzhis ka rtse, Pa rnam and Rnam gling that were under the administration of the Tibetan government, many small estates were given to Bkra shis lhun po. However, to the east of Gam pa la (the border between Dbus and Gtsang) Bkra shis lhun po had only one small estate, Sku ‘bum thang. There were three large bla brang under the jurisdiction (mnga’ khongs) of the Tibetan government. These were Bkra shis lhun po, Chab mdo, and Brag g.yab. Brag g.yab had 72 `bands’ (‘tsho shog) of mi ser. Chab mdo had six rdzongs and 18 brgya shog (unit of 100). But these two bla brangs were no match for Bkra shis lhun po in terms of both land and mi ser (Bkra shis lhun po was much wealthier). So Bkra shis lhun po was the largest bla brang in Tibet and as such enjoyed many privileges. The steward (phyag mdzod) of Bkra shis lhun po was appointed by the Panchen Lama and his rank was equivalent to that of a bka’ blon (minister). This was a rank acquired during the time of the Manchu Emperor. There were not many officials in the bla brang. In terms of rank, titles, and dress these officials were same as those of the Tibetan government. But the lay officials did not wear their hair in a knot on top of their heads as was the custom for the lay officials of the Tibetan government. Because Bkra shis lhun po possessed many gtan tshig (documents which validate rights) given by successive Dalai Lamas it was not required to pay as much tax as did the other bla brang, but it was subject to the corvee and the military taxes like everyone else. On these two taxes the government made no concessions to anyone. Due to its large size and its having many concessions of taxes, Bkra shis lhun po was subject to a special tax. This was the payment of one-fourth of the army salary in times of war, and this custom became established when Tibet was at war with the Nepalese. No one else was subject to this tax. However, Bkra shis lhun po too was not subjected to paying one-fourth of the army salary during the two wars with the British when the British were occupying India. Since about 1910 there was continuous fighting between China and Tibet over the border regions. At that time the Tibetan government wanted Bkra shis lhun po to provide one-fourth of the army salary as had traditionally been done. However, Bkra shis lhun po delayed in carrying out the government’s orders by claiming that Bkra shis lhun po had provided one-fourth of the army salary during the war with Nepal because that war was fought on Bkra shis lhun po’s soil and that in all other instances it had not been known to provide army salary. But the government insisted that for the good of all Tibet Bkra shis lhun po must provide one-fourth of the army salary. After several years Bkra shis lhun po agreed to pay the salary in accordance with government orders. 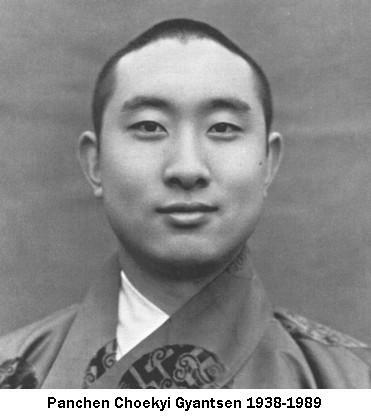 While in the midst of carrying out this order, suddenly the Panchen Lama, his chief official gsol che Blo bzang rgyal mtshan, his favorite servant (spyan bsal) Blo bzang, another servant called Blo bzang dpal ldan, and several other minor officials and their servants , altogether numbering about hundred, left for China via Byang Thang. The Tibetan government officials, such as the rdzong dpon, who lived close to Bkra shis lhun po bla brang did not know of the Panchen Lama’s departure. The talks about the Panchen Lama’s return started just before the death of the 13th Dalai Lama. It was a time when relations between China and the Tibetan government were very good. In 1931 the Tibetan representative in Peking, Ta’a bla ma Dkon mchog ‘byung gnas was sent to Lhasa by the Chinese government with a letter strengthening the friendly relationship. The day that letter was delivered to the Dalai Lama the gongs and bugles were sounded from the palace in its honor. Ordinarily such things were done only on New Year’s day or when the Dalai Lama was traveling. Another messenger that was sent from China for the purpose of indicating their friendship a was woman named Liu Man-chen. With the hope of further strengthening such friendship and avoiding any disputes regarding the borders between Tibet and China, and the warlords who controlled the border regions, representatives from Tibet and China met to settle the border issues. The Chinese representatives were T’ang Kho-sen and Liu Tse t’en, and the Tibetan representative was Khyung ram. After several months most of the border issues were settled. According to the settlements such areas as Nyag rong and Tshwa kha lho which for many years had been lost to Tibet were returned. However, the warlords were not satisfied with the settlements that were made and with various excuses delayed the signing of the papers. The Chinese representatives returned without having completed their assignments. Following this the warlords of Sichuan and Ch’inghai, namely Liu Wen-hui and Ma Pu-fang, started invading Tibet and many areas in Khams were lost to them. Then the Dalai Lama contacted the Chinese central government via India, and due to the Central government’s intervention the advance of the warlords was curtailed. One can see from the above mentioned instances that the Chinese central government had intentions only to be friends with Tibet and not to start any war. Seeing that the presence of the Panchen Lama and officials would inevitably sever the friendly relationships with the Tibetan government the Chinese not only advised the Panchen Lama to return to Tibet many times, but also invited the Tibetan government’s representative with the Panchen Lama, and while they were together advised the Panchen Lama to return. As a result of this two of the Panchen Lama’s most important officials, Blo bzang dbang phyug and the chief secretary Blo bzang rgyal mtshan arrived in Lhasa. Those two officials were treated very well by the Tibetan government. A house was prepared for them to stay and special aides were appointed to assist them. A small committee was also established to conduct the talks relating to the Panchen Lama. At that time many of the problems that had remained unsettled for many years were solved. For example, about the army salary a new resolution was drawn whereby Bkra shis lhun po would pay the army salary in accordance with the size of land they held and not the arbitrary one-fourth that was customary previously. However, certain important matters, such as Bkra shis lhun po’s requests that a separate garrison be established for all the soldiers sent by Bkra shis lhun po and that this garrison be assigned as the Panchen Lama’s bodyguards, and that the Central government grant Gzhis ka rdzong to Bkra shis lhun po, remained unsettled. While these talks were still being carried on the 13th Dalai Lama died. And the talks regarding the Panchen Lama were postponed for sometime. The year after the death of the Dalai Lama, the Chinese central government dispatched a delegation to Tibet to offer condolences and to do homage by making offerings to the monasteries, etc. This delegation consisted of Wang Lung-sung and several other minor officials. That delegation conducted all the appropriate religious activities, such as making offerings to the tomb of the Dalai Lama and the monasteries and in no way engaged in political activities. However they did advise that the talks relating to the Panchen Lama’s return be resumed. Furthermore the two Chinese representatives who were in Lhasa also advised that the talks should be resumed, and it was done. After Wang Lung-sung returned he left some of the minor officials and the radio operators behind in Lhasa. Since that time there was always a Chinese representative in Lhasa. With regard to the Panchen Lama, all the Tibetans from Regent Rwa sgreng downwards were in favor of his return and had requested the Panchen Lama to return at once. For that purpose two government officials, Theji Dga’ bzhi, Mkhan chung Byams pa chos dbang and the mkhan po of the three monasteries, Sera, ‘Bras spung, and Dga’ ldan were sent to Ch’inghai Province. C. When the Panchen Lama left Sining the Chinese government sent three hundred troops with him. Upon hearing this news in Lhasa, an emergency meeting was called, and from this assembly it was decided that such a large troop should not be allowed to enter Tibet. As a result of this the Tibetan government ordered the governor of Eastern Tibet that he should inform the Panchen Lams that he must send back the troops from the Chinese-Tibetan border, and if the Panchen Lama did not concede to this he (the governor) should by military force turn back the troops accompanying the Panchen Lama. In accordance with these orders from the government the governor dispatched an official to Skye rgu mdo, which is in Ch’inghai, to meet the Panchen Lama. Following this, the governor and several of the Panchen Lama’s high officials met at the border to discuss the matter, and talks lasted for several months. However, the Panchen Lama insisted that he would not turn back the troops from the border and stayed in Skye rgu mdo for more than a year. Skye rgu mdo was one of the larger trading centers of Eastern Tibet, but because the Panchen Lama’s party consisted of such a large numbers it became difficult to find enough supplies for all the people and horses. The governor of Khams provided thousands of loads of supplies. Then the governor heard that the Panchen Lama had been taken ill. He immediately sent two officials to the Panchen Lama saying that the Panchen Lama and his party should come to Chab mdo, as the climate in Skye rgu rdo was not only cold but since it was then nearing winter it would become even more difficult, and that the matter regarding the troops had been settled by the Assembly in Lhasa and he could do nothing about it. It appears that the Panchen Lama himself had wanted to come, but all he said was that it made no difference to him where he stayed. However his officials were against his going to Chab mdo. Because of his health the Panchen Lama spent a few months at a hot spring near Skye rgu mdo but after that again returned to Skye rgu mdo where he died soon after. As soon as the Governor of Khams heard this sad news he immediately dispatched an able officer to Skye rgu mdo to make offerings and also to carry out an important assignment. This important assignment was to notify the Panchen Lama’s retinue to turn back the Chinese troops as there was no longer any reason to retain them since the Panchen Lama had died, and the officials with the Panchen Lama’s body should return to Tibet where they would be accorded the same treatment had the Panchen Lama lived. There was a lot of disagreement among the Bkra shis lhun po officials. The older officials and the servants had wanted to return to Tibet, but the younger officials who actually held the power did not wish to return. In the end it was settled that they would remain in Skye rgu mdo, and the Central Government’s official together with few of the older Bkra shis lhun po officials and their servants returned to Tibet bringing a huge amount of unimportant belongings. Soon after the younger officials took the Panchen Lama’s body to Dkar mdzes Monastery in Sichuan Province. D. No Tibetan was against the Panchen Lama’s returning to Tibet. The Panchen Lama had gone to China of his own accord and not because the Tibetan government had asked him to leave. The Tibetans are very religious people, and they wished very much to see the Panchen Lama. But because the Panchen Lama was accompanied by 300 Chinese troops people were afraid. During the Manchu’s rule the Tibetan people had been subjected to many hardships and so they feared that a similar situation might develop, for although the administrators of Tibet such as Rwa sgreng regent knew the difference between monarchy and republic the actual power lay in the hands of the people and so the troops sent by the Chinese government were not allowed to enter Tibet. Because of that the Panchen Lama had refused to come to Tibet. It was not because the Tibetans did not want him or his retinue to return to Tibet. The Chinese government must have been offended by the Tibetans people’s attitude, but because China was then engaged in war with Japan, Tibet did not suffer any dire consequences. E. After the Panchen Lama’s death in Skye rgu mdo, the Chinese troops returned to China. About three hundred members of the Panchen Lama’s party, which consisted of the younger officials who held the power, their subordinates, and the newly recruited soldiers moved to Dkar mdzes Monastery which was under the warlord Liu Wen-hui. Dkar mdzes Monastery was one of the largest monasteries in Eastern Tibet. There were about 2,000 monks in it. The administrator of that region had only one daughter and she married one of the Panchen Lama’s officials and that helped to consolidate the relationships between the natives and the Panchen Lama’s retinue. There were about 500 hundred Sichuan troops and officers stationed in that region as border guards but about a year after the arrival of the Panchen Lama’s retinue, the power shifted over to the Bkra shis lhun po party and Sichuan lost its former foothold. However the border guards and officers still remained there. The Bkra shis lhun po officials hoped to extend their power to all the regions east of the ‘Bri chu which were ethnically Tibetan and to establish a new Tibetan Government. They drew up a resolution to that end and attempted to gain the support of the monasteries and the regional administrators. However, because the relationships between the Tibetan central government and the larger monasteries and the regional administrators such as the king of Sde dge were good, they remained firm. Soon after that the Bkra shis lhun po troops with the support of the people of that region suddenly attacked the Sichuan garrison. After a few days of fighting, the Sichuan garrison and rdzong dpons surrendered. They also captured few small neighboring regions. The officials of Bkra shis lhun po then called upon the Tibetans of the eastern part of Khams to mobilize and drive out the Sichuan troops. In keeping with those events, the Governor of Eastern Tibet (mdo smad spyi ‘doms) attempted to create unity among the Tibetans by sending two officials, Blo bzang dam chos and Skyar srib to the Bkra shis lhun po officials with the message that the Sichuanese were engaged in large scale military preparations and that Bkra shis lhun po would not be able to hold on to those eastern regions they had captured for any length of time, so the Panchen Lama’s body should be sent to Chab mdo, and that if the Governor sent Tibetan government’s troops to support them it would not prove difficult to consolidate all the petty kingdoms and the monasteries. When those two officials arrived at Dkar mdzes they were welcomed elaborately and made it appear as though there was real unity among the Tibetans. However, several of the powerful Bkra shis lhun po officials were confident that they would not only be able to hold Dkar mdzes without any outside aid but that they would also be able to consolidate all the eastern regions under their power. They then declined the help offered by the Governor of Eastern Tibet saying that there was no danger to those regions they had occupied and that should it become necessary they would bring the Panchen Lama’s body to Chab mdo. It seems that majority of the people under Bkra shis lhun po had wanted to be united with the Central Government and had put forth many suggestions to that effect. But the people’s opinions were unheeded. Still the two officials sent by the Governor did not give up hope and remained in Dkar mdzes. The Tibetan government envisioned that once the Sichuan troops attacked Bkra shis lhun no would be no match for them and would be willing to concede to the Tibetan government’s wishes. Two months later the aspirations of both Bkra shis lhun po and the Government was destroyed for Sichuan troops suddenly arrived in large numbers. The Bkra shis lhun po troops did put up some resistance but soon lost their ground. The Bkra shis lhun po party and rulers of that region fled to Ch’inghai. When they arrived at Byang thang, they sent a small party with the Panchen Lama’s body to Tibet. The Tibetan government received this with due ceremony and transported the body to Bkra shis lhun po monastery, and a silver mchod rten was erected as had been done for all the previous Panchen Lamas. The majority of the Bkra shis lhun po party remained in Ch’inghai, and asked the Chinese central government for protection. F. The search for the Panchen Lama’s reincarnation. While the party was in Ch’inghai they started the search for the Panchen Lama’s reincarnation. At that time in Tibet too a complete set of officials were administering the affairs of Bkra shis lhun po. Among those the main responsibility lay in the hands of several officials sent from the Tibetan central government, and they worked jointly with the Bkra shis lhun po officials in search for the Panchen Lama’s reincarnation. Search parties were sent all over Tibet to find whether any boy possessing miraculous attributes had been born or not. Many such boys were found, and all information regarding those boys such as their snapshots, age and birthplace were submitted to the Dalai Lama. From among those, the Dalai Lama picked three boys who were far more distinctive than the others after careful examination and thugs dam (divining) and ordered that one of the three should be installed as the Panchen Lama after their names has been tossed (brtag hril) in the gtsug lag khang in front of the (? P.l9). Of the three that had been chosen by the Dalai Lama two were born in Ch’inghai and one in Khams. Formerly the custom was to bring all the final candidates to Lhasa and after they had all gathered the Amban would shake the names in the golden urn and thus the final decision would be made. Because of that the candidate born in Khams had already been brought to Lhasa by those officials who were in Tibet. However the two who were born in Ch’inghai were not brought to Lhasa and the Bkra shis lhun po officials who were in Ch’inghai repeatedly rebuffed the urgings of the Tibetan government. After about two years one of the candidates died. Then the Bkra shis lhun po officials requested that the other one be recognized as the Panchen Lama since he possessed so many wondrous attributes. The Tibetan government did not agree to that, for the government anticipated that if the Panchen Lama were recognized while he was on foreign soil all the previous troubles would remain unsolved. Those officials powerful in Ch’inghai hoped to return to Tibet proudly with powerful military guards and not humbly. Because of that they held on to the boy who was born in Ch’inghai and informed the Chinese central government. The Chinese government recognized that boy as the reincarnation of the Panchen and sent representatives when he was formally installed. However, the Tibetan government and those Bkra shis lhun po officials in Tibet did not accept him as the true reincarnation. In the latter part of 1951 several of the Bkra shis lhun po officials among whom the most important one was Dza sag Bkras mthong (Ce’i ‘jigs med), came to Central Tibet with the communist troops. The Tibetan government was thrown into a state of fear and rather than pursue the problems relating to the Panchen Lama’s reincarnation it recognized the boy from Ch’inghai as the reincarnation and handed Bkra shis lhun po over to Dza sag Bkras mthong. The officials that had been sent to administer Bkra shis lhun po, namely Dza sag Rong dpal lhun, and three other officials, then returned to Lhasa. In 1952 the present Panchen Lama, and his retinue arrived in Lhasa. The Tibetan government was going through a most difficult period then. It was the start of the Tibetan people’s silent (peaceful) revolt against the communists. The two most powerful men under the Dalai Lama, the prime ministers Blo bzang bkra shis and Klu khang were accused by the Chinese of instigating the people and they persistently persuaded the Dalai Lama that he should get rid of the two prime ministers. The Dalai Lama and the Tibetan government was facing this difficult dilemma when the Panchen Lama was nearing Lhasa. The communists insisted that the two prime ministers must resign before the Panchen Lama entered Lhasa and because this request was accompanied by military threats the Dalai Lama had no choice but to ask the two prime ministers to resign. Three days later the Panchen Lama arrived in Lhasa. A very elaborate reception was held in his honor at which all the lamas, mkhan pos of the monasteries, and all the government officials were present together with military parade, etc. Likewise the Chinese also prepared a most elaborate reception. A few days before the arrival of the Panchen Lama several of the Bkra shis lhun po officials arrived to discuss how the meeting between the Dalai Lama and the Panchen Lama should take place. Those officials arrogantly reviewed all the details such as the height of the thrones. etc. Nevertheless, when the Panchen Lama first met the Dalai Lama he (the Panchen) prostrated to the Dalai Lama as had always been the custom, and in every way acted according to the traditional customs. The Chinese communists had wanted to exploit that occasion to prove their point that the Tibetan government and Bkra shis lhun po bla brang were two separate entities. For instance in China formerly the office of the Tibetan government’s representatives was referred to as the Tibetan Office and that of Bkra shis lhun po as the Panchen Lama’s Office. But after the Communists took over they were called Dalai Lama’s Office and the Panchen Lama’s Office respectively and any reference to Tibet was omitted. At the time of the Panchen Lama’s arrival in Lhasa none of the previous disagreements were brought up and after about a month the Panchen Lama returned to Bkra shis lhun po where the formal inauguration was to take place. « I’m No Less a Tibetan….